Charles Luney Auditorium - Acoustic Engineering Services provides measurement, design advice, and expert evidence in the field of acoustics and noise control. A 700-seat auditorium with a semi-circular plan provides provided some interesting challenges for the AES team. 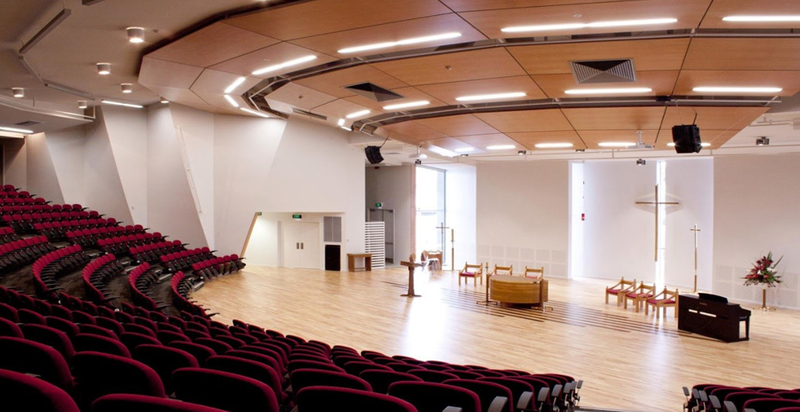 Whilst this layout is advantageous for the audience’s proximity to and view of the stage, the proposed layout for the Charles Luney Auditorium at St Margaret’s College in Christchurch was acoustically difficult, as lead acoustic engineer on the project Jeremy Trevathan explains – “The curved seating tiers and large curved back wall would have reflected sound back towards the stage – causing large variations in sound level over the audience area, and a very difficult environment for performers”. Using 3D modelling, AES were able to determine how to control and direct the sound to optimise performer and audience experience, while retaining the semi-circular shape the Client and architect loved. This involved the use of a visually-impressive array of concentric timber reflectors above the stage and audience area, along with vertical reflectors to make the most of the auditorium side walls and ensure audience members felt ‘enveloped’ by the sound. Potentially problematic reflections and focusing from the curved rear wall were avoided by breaking up and re-orientating surfaces to distribute reflected sound evenly, rather than focus it all in one location, and through the use of acoustic absorption materials. The facility opened in May 2013, providing a much-needed alternative performance venue for post-earthquake Christchurch and has seen a high level of use including as a venue for live television, and extensive use for Christchurch Symphony Orchestra and Chamber Music New Zealand events.